Be careful with those ever so delicate roof drip moldings! These thin, stainless moldings literally “pinch” over the drip channel in the roofline. The best way to remove them is to use a small block of wood and a rubber mallet. In some cases, you can actually remove them by hand. But like we said, they are extremely fragile and easy to kink, so be very careful. Start from whatever end of the molding is easiest. Wedge the end of the wood block underneath the lip and slightly tap it with the mallet. Try to avoid a “square” hit on the lip of the molding. This will only damage the piece and make it more difficult to remove. The key is to position the block just behind the lip between the roof channel and the molding. It should take minimal force to pop and release the trim from the roof. Can the drip rail molding be use on a 1970 El Camino? I have replace the weatherstripping on my car but at the car wash it leaks a lot. Suggestions? It will definitely help channel the water away from your door, but it won’t stop the water from coming in through your weatherstripping. 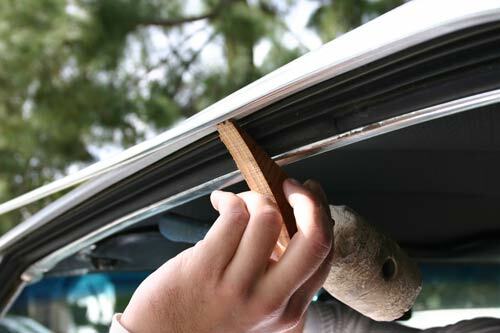 New weatherstripping, when properly installed, should seal your door well and not allow any water in.